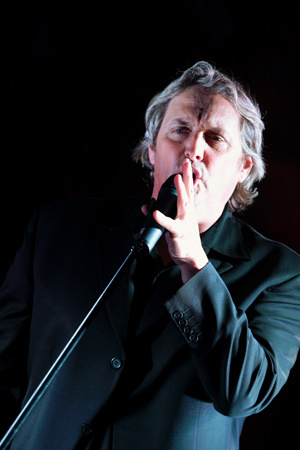 Don’t miss your chance to witness one of Australia’s finest tributes to John Farnham. Full 5 - 6 piece band or Duo option available. Mike Vee, “The Voice” of John Farnham has been performing himself for over 2 decades and in that time he has built up a reputation as a truly dedicated entertainer with an amazing voice. His uncanny resemblance, the tone of his voice, his outgoing nature are so much like the real thing that people often ask him are you related which is a comment that is humbling to Mike, but at the same time recognition and credit to his performance. As a solo performer he has opened shows for International artists such as Foster and Allen and Keith Urban. He has sung the National Anthem for The N.R.L in front of 25,000 people. Danni Minogue Australia’s got Talent quoted recently after Mike’s performance - “I thought I was at a John Farnham concert” !! And Red Simmons said - “not only do you look and sound like Farnham, you must have ate him”! Mike has added a touch of theatre and comedy into the show making it a fun night of music and entertainment. To play the part of someone else you have to study the character. This is evident in Mike’s every performance. The Whispering Jack Show features a 5 - 6 piece band complete with female vocalist and uses all the modern technology available today to reproduce the full Farnham sound that fans have come to expect. Songs you will hear in the show include; The Voice, Reasons, Help, Age of reason, Chain reaction, Touch of Paradise & That’s Freedom this list goes on and on. And yes they even do 'Sadie' if you ask for it!